The name Moog is legendary. The classic sound of an analog Moog synth is unparalleled. And they’re at it again! Moog’s latest release is the Moog Sub Phatty, which includes two variable waveshape oscillators, one square wave sub oscillator, and one noise generator. This synth has been dubbed the “grittiest Moog ever”, and after hearing a number of demos, I can say that I agree. The Moog Sub Phatty also introduces Moogs new Multidrive section, adding a wealth of grit to the sound of the synth. 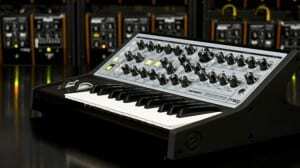 Overall, the Moog Sub Phatty seems to fill a great niche for Moog and will be a great addition to the Moog family.